Material: Stainless Steel ASTM/ASME SA182 F304/L & F316/L. 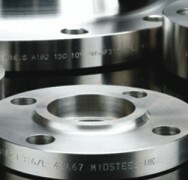 Blind, Bossed Blind and Long Weld Neck Flanges. BS EN1092-1 PN10/16/25/40 Type 01, 05, 11, 12, & 13. Plate Slip On, Blind, Weld Neck, Bossed Slip On and Screwed Flanges. Flange with BS10 Table ‘E’ Thickness Bored for OD Tube. BS 10 Table ‘D’ & ‘E’. Plate Slip On and Blind Flanges. Blind and Bossed Blind Flanges.